We work with ASX listed company's to build incredible IR websites that deliver on strong branding - speed and security, our simple news distribution keeps your investors informed. Push is your all inclusive investor relations platform. We set out to create products that would transform the way investor relations are handled. Today, our platform is serving some of Australia's top ASX listed company's. Bring growth and performance to your story. Move your company to the forefront in design and deployment, benefiting current and future stakeholders. Your announcements and news added seconds after ASX approval, straight to your website. Want to add your own content? No problems just use the Push CMS to add/edit your news. Work with designers that have helped some of the largest corporations globally and in Australia, their work is used daily by millions of users. With Push your in good hands. All our clients can rest easy knowing Push uses the latest web standards. All our packages have 24/7 support, plus we automatically backup your website while you work, restore with one click. Have multiple teammates working on your site at the same time, without stepping on each other's toes. Need to change an article's headline? Edit it once, and it’ll update across the site. Make changes straight onto the live website and your content will update automatically. After we publish your site, give your colleges or teammates access so they can edit and add new content anytime. 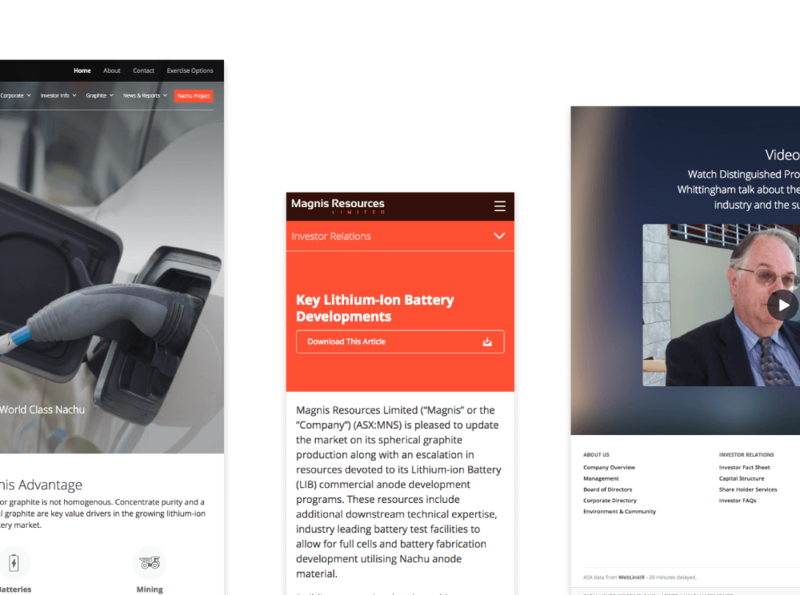 See how We helped Magnis Resources leverage the power of Push To Grow There Identity Plus their Subscriber list. Push helped Magnis grow their email subscriber list by 250% in 1 year. See our vision of what makes a great investor website and how it can work for you. Work with Push to give your company the best chance to tell and present your exciting and important news to your investors. We don't believe in systems that are set and forget, all great products require time and resources. Push is built on the shoulders of giants who are experts in their fields. Lets push your IR website to the next level and work closely together. We host your site on Amazon AWS, and maintain a world-class database server that you won't have to manage or worry about. We automatically save backups of your full site while you work, and you can manually save it whenever you’d like. Instantly restore old versions with a click. We host your sites on multiple AWS servers and serve up assets via Fastly and Amazon CloudFront, so your pages load in no time and update in seconds. We make improvements and bug fixes frequently, and you’ll get them all for free — without having to download or back up a thing.